Interested in researching businesses, employers, or industries in your area? 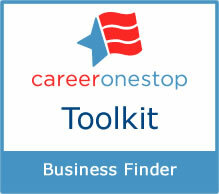 The new Business Finder replaces CareerOneStop’s former Employer Locator with enhanced features and streamlined design. Aligned with CareerOneStop’s overall redesign, improvements include a single search box to enter your preferred search criteria, an easy-to-read results page, and improved filters to help you narrow your results. Job seekers can learn about businesses, government agencies, and non-profit organizations that may be hiring in their local area. They can locate nearly 12 million employers by business name, industry, occupation, or location. For each business, they’ll find basic information including addresses and phone numbers for contacting about potential job openings. Targeting a job search. Job seekers or counselors can get a list of organizations likely to employ people in your occupation or industry, and contact them to inquire about job openings. Job interview research. Job seekers can find basic information about businesses, and research their competitors or suppliers to be ready for interview questions. Industry research. Businesses, economic developers, students, or job seekers can identify businesses in any industry by city, state, or regional area. The Business Finder will soon be available as a web service. 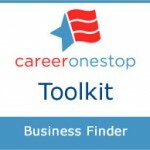 If you are interested in integrating the Business Finder into your website, email us at info@careeronestop.org so we may contact you when Web Services become available. I think the site has become less transparent…lots of pretty pictures obscure the real value of the site’s offerings.